We all know how much fun it is to ride Pedego Electric Bikes, but it’s not so fun to worry about theft while running into a store or stopping for a bite to eat. How can we keep our beloved Pedegos safe? Nothing is 100%, but one of the best strategies for securing a bike is to use two locks, preferably two different kinds of locks. In the graphic here you see a U-Lock securing the frame and rear wheel with a cable lock going through the U-Lock and the front tire. A thief would need more time and a wider variety of tools to cut or break both of them. Locks have ratings. Get something around mid-level or above. The higher the rating, the heavier, more costly, and less easy to use it’s likely to be. If your bike is going to be locked up for a long time or in the same location over and over, your risk is higher, so you might want to trade convenience for better security. Locks requiring a key are always rated higher than combination locks. For locking to bike racks, high rated u-locks are great. Shorter is more secure, but longer is more useful. Heavy chains are versatile, but they’re really heavy and can be awkward to use. ABUS folding locks are convenient and available in a variety of security levels. 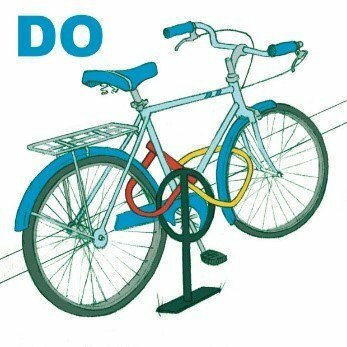 Cables are easy to cut, and I would only recommended them for very short stops or for locking a seat or wheel to the frame. If your bike does get stolen, you might be covered by your homeowners insurance, but some policies only cover bikes while at home, and some don’t cover ebikes at all. Be sure to check with your insurance carrier and make sure they specify in your policy that your electric bikes are covered. If your insurance isn’t adequate, look into Velosurance. They offer ebike insurance with options for theft, liability, and even roadside assistance. Personally, I’m a worrier when it comes to parking, and no lock is going to put my mind fully at ease, but knowing how to lock a bike properly helps me to enjoy my Pedego to its fullest.